Law Enforcement Self Defense Leather Sap Gloves | BUDK.com - Knives & Swords At The Lowest Prices! 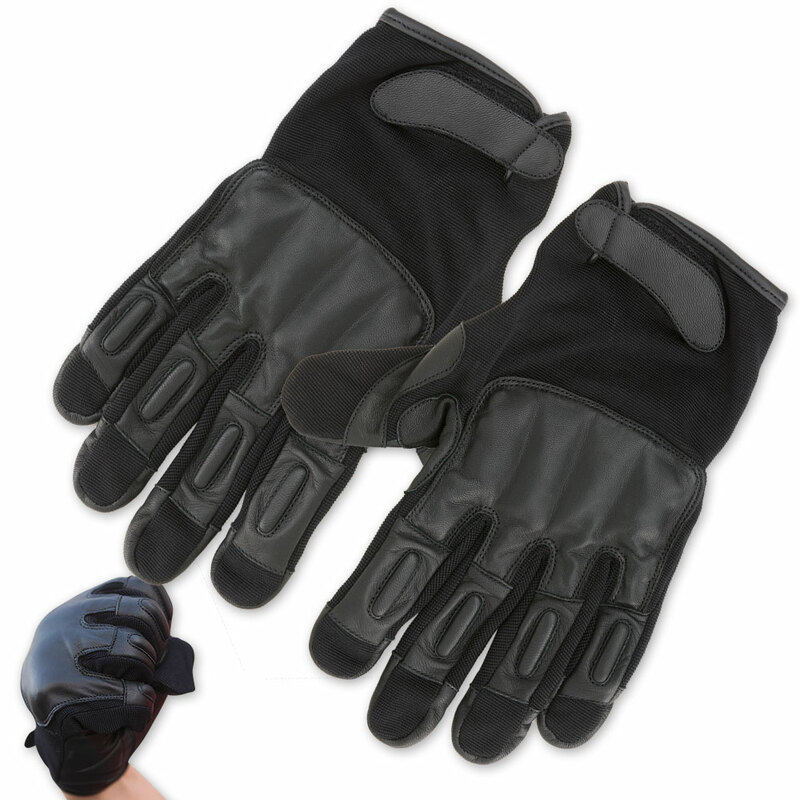 Used extensively by law enforcement and military personnel, security guards, and defense contractors, these leather sap gloves are the real deal, bringing you powerful self defense you can count on. They are easily concealed, but pack a mighty punch when called upon. Each one provides eight ounces of rock-solid steel over the knuckles and the back of the hand, covered by thick leather padding that will help absorb and displace impact. The textured spandex provides breathability, and the Velcro strap allows you to achieve a customized fit. Whether you're simply out for an evening walk or heading up the neighborhood watch group, these leather extreme sap gloves offer discreet but highly effective personal defense. they are very cool and do absorb impact. they are a little tight on your knuckles but that might just be my hands. they also have really nice pads on them as well. I use these at my part time bouncing job. They work great! Just ordering another pair because the left glove is made of thinner, cheaper leather and has completely blown apart at all the seams on the palm and finger tips. The right glove still looks new. And I'm right handed so the left glove is just poor quality BS. I would definitely recommend these to anyone, i have had a few different pairs, although if you are going to purchase i would STRONGLY recommend getting the lead weighted instead of the steel, for various reasons, including they are thinner and seem to be more powerful. Other than that it's a great buy. I have had several pairs of SAP gloves, hands down the best are Hatch. I primarily got them to wear while riding to protect my hands, but I can state that the Hatch are mostly leather with some nylon, but nothing cheap about them, the steel shot it right where it needs to be on the knuckles and padding on the fingers. After the multiple pairs I've owned from several manufacturer's Hatch is the only ones I will ever buy. When these came in the first thing I noticed was that the leather holding the metal was different quality on the left side, thinner, and showed the metal after messing around with them for a bit. But overall it's great, for self defense purposes and scaring people. For those comments about using these for punching... that is NOT the intent. A sap is a bludgeoning weapon, these are meant more for slapping someone without having your hand in them. Almost like a duel challenge of old... though the challenge might be over before it starts with these. These are nicely made gloves. The nylon is a little thin and cheap but not bad. My big problem is that all the lead is on the back of the glove, NOT in the knuckles or in the proximal phalanges (where you would wear a ring) of the fingers, this renders it ineffective for delivering a punch. The location WOULD give you a nice back fist blow or protect the metacarpal bones from a blow or cut but that's not what I'm looking for. ok so i got my gloves last week. i could feel the weight right away. they are very powerful and i have highly recommended them to a few friends who are jumped a lot on the streets and have troubles. i just got the gloves and i decided to punch some wooden boards the first one i punched broke in half the next one shattered. these gloves are really good i suggest buying these all the way (i'm writing this with them on now) they are a good price. Weak material binding the leather pieces together. Noticeable when wearing them.